Managing natural environments involves making difficult decisions about when to intervene to prevent undesirable changes. Intervening too early may result in unnecessary management actions, while intervening too late may lead to much greater costs or irreversible outcomes. ‘Decision triggers’ is one approach that can be useful to help link monitoring data with management decisions. Decision triggers represent a point or zone in the status of a monitored variable indicating when management intervention is required to address undesirable ecosystem changes (Figure 1). In 2014, we brought together conservation managers and scientists from across Australia and New Zealand to share ideas and accelerate progress toward the development of decision triggers for protected area management (see Decision Point #81). Our workshop formed the basis of three peer-review papers, where we: 1) explored the science behind decision triggers, and why conservation scientists are embracing the concept; 2) gathered perspectives from conservation practitioners on the current use and potential future application of decision triggers; and 3) developed guidance for conservation practitioners on the process and tools available to help integrate decision triggers into existing planning and management frameworks. Here are some key insights emerging from that work. One strand of our research explored the science behind decision triggers and why they, and related concepts, are growing in favour within the scientific community (Cook et al, 2016). Evidence-based management involves using the best available evidence to support decisions. 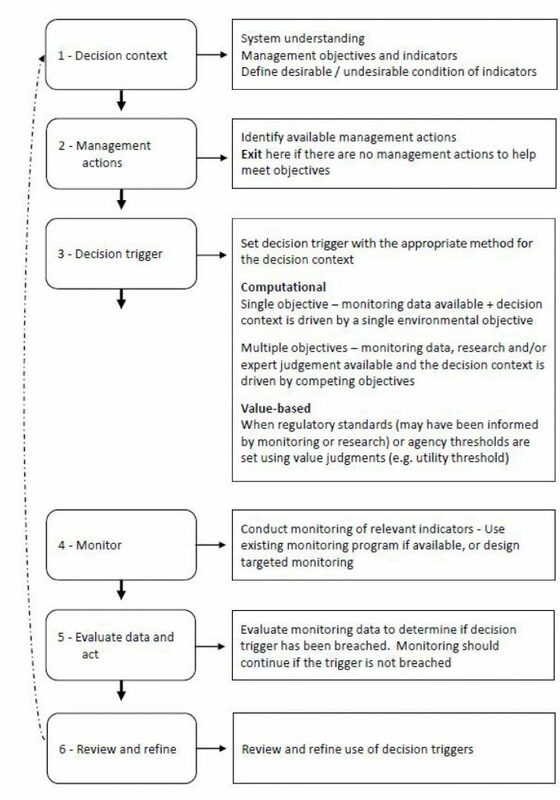 Decision triggers fill a critical gap in operationalising evidence-based management, by linking monitoring data with a decision about when and how conservation managers should act if a system moves towards an undesirable state. A variety of terms used in the scientific literature are analogous with the decision triggers concept (see Table 2 in Cook et al, 2016 for a full list of terms and definitions). The primary aim of decision triggers is to help decision-makers determine when to intervene in any managed system through a systematic, a priori consideration of the desired state of the system and the management interventions that can positively influence that state. Setting a decision trigger requires an ecological attribute or threatening process (the target for management) to be monitored. The boundary between the zones defined as desirable and undesirable system states becomes the trigger point for action (Figure 1a). A more nuanced view of the system may identify multiple states (eg, desirable, acceptable, undesirable and unacceptable), with trigger points for different actions associated with each of the boundaries between these zones (Figure 1b). The benefit of multiple states is that corrective actions can be tailored to potentially offer early intervention options that may be cheaper or less invasive, correcting the system before unacceptable changes occur. For example, a trigger point between desirable and acceptable states in the case of a threatened species may initiate more in situ conservation actions, such as reproduction support (eg, adding nest boxes), while crossing the boundary between undesirable and unacceptable may trigger the more extreme action of taking individuals from the wild for a captive breeding program. Multiple trigger points also accommodate uncertainty as to the exact value that would be best. Decision triggers can be informed by ecological thresholds when they exist and are understood. This can assist managers to prevent catastrophic shifts in ecosystems. However, decision triggers can also be designed to manage and counter processes that lead to more gradual and continuous degradation or a priori environmental targets (eg, those set in regulations), whereby the desired condition of the system is defined and triggers can be set to keep the system within a preferred ecological state. The development and implementation of decision triggers should not be seen as a one-off process in which trigger points, and the possible management actions associated to them, are set and become fixed or immovable. Evidence-based management is an iterative process (eg, adaptive management and structured decision-making), and decision triggers should be evaluated and adjusted over time as new information becomes available. This is critical because not only will our understanding of the system improve over time, but the responses of the system itself are also likely to be modified in response to environmental change. Despite an increasing acceptance of the value of decision triggers, there is a need for greater understanding of the suite of methods that can assist in setting decision triggers and guidance on how to integrate triggers into the existing management approaches within organisations. Moving the concept of decision triggers forward requires the conservation community, both scientists and decision-makers, to work together to ensure decision triggers are as robust as possible but also able to be implemented within the realistic management contexts faced by management organisations. How well do conservation practitioners support and use decision triggers? This was another element of our research and answering this question involved consultations with managers about their practice (Addison et al, 2016). We found a wide range of organisational motivations for developing and using decision triggers. Many of these go well beyond a desire to prevent negative conservation outcomes. Other important motivations include: supporting decision-making by providing clarity about when and how to act; improving transparency of organizational decisions; removing the need for guess work; and guarding against the paralysing effects of uncertainty. However, the results of our consultations suggest that the application of decision-triggers was ad hoc. Examples of where it had been applied related to specific systems, primarily where threats are well-understood or management issues are controversial. For example, managing significant threats to biodiversity from fire or invasive species management, setting quotas for harvesting or controlling native species, and determining when to remove threatened populations from the wild. While these examples are encouraging, they are also rare. Practitioners shared their views on the operational barriers (issues within organisations) and scientific knowledge gaps (lack of knowledge or techniques) impeding the development and implementation of decision triggers. This revealed that most organisations are facing similar challenges (eg, insufficient resources and the lack of a process and methods for developing decision triggers across different contexts), and this is hampering the routine use of decision triggers. Gaps in scientific understanding of how systems function were also seen as a major issue impeding the adoption of decision triggers (eg, uncertainties around ecological processes, and a lack of targeted, robust and reliable baseline monitoring data; Figure 2). Practitioners are keen to adopt decision triggers as part of routine management for a range of threats, species and ecosystems. However, integrating decision triggers into day-to-day management requires methods that can be widely applied. Practitioners were seeking support from the academic community to overcome the barriers they face. They were particularly interested in seeing an overarching process and supporting methods to develop decision triggers that would fit within existing management frameworks and allow for flexibility, such that decision triggers can be developed for different management contexts, rather than prescribing a one-size-fits-all approach. Figure 2: The frequency of operational barriers and scientific knowledge gaps identified as impeding the adoption of a decision triggers by practitioners (see Addison et al. (2016) Table 2 for full details). The final strand in this research drew on the depth of existing management, evaluation and conservation planning frameworks to highlight how the development and implementation of decision triggers align with the critical stages of evidence-based decision-making (Figure 3; de Bie et al, 2017). Importantly, we identified where these steps fit within the existing frameworks used by management agencies. These frameworks are no doubt familiar to Decision Point readers: Adaptive Management, the Open Standards for Conservation Measures, Management Strategy Evaluation, Structured Decision-making, and Vital Signs Monitoring (see Table 1 in de Bie et al. (2017) for details). These commonly used frameworks all cover the critical stages for practitioners to integrate evidence into decision-making. The development and effective integration of decision triggers relies on a robust process for the initial stages of decision-making, including (Step 1, Figure 3) setting the decision context and identifying objectives and indicators, and (Step 2) determining management actions. Decision triggers can be set using a number of methods, depending on the availability of scientific data and expertize, the number of objectives for management and the resources available. One consideration in selecting the most appropriate methods is whether decision triggers are to be set for single or multi-objective decisions, and whether decision triggers will be set using value-based information and/or scientific evidence (Step 4; Figure 3). Within the diversity of approaches are options that can be used in data-rich situations (ie, where there is a robust evidence base) as well as the more common data-poor situations. Under single objective management contexts, where there is one objective for the system (eg, an environmental objective that is managed and monitored, in the absence of any competing environmental, social, or economic objectives), statistical approaches are appropriate to develop decision triggers. For example, control charts, statistical thresholds, or thresholds of potential concern, can be used to determine the statistical bounds of natural variation to inform bounds of acceptable and unacceptable system states and associated trigger points for action. Under contexts where there are multiple competing objectives (eg, competing social, economic, political and/or environmental objectives) it may be more appropriate to use predictive methods to set trigger points, which explicitly deal with potential trade-offs among objectives. For example, optimisation modelling or multi-objective participatory modelling, can be used to formally trade-off competing objectives and assist with setting decision triggers. Value-based approaches can be used in situations where social, economic and/or political factors are dominant. This is where decision triggers can be based entirely on values or preferences, reflected through a utility threshold or regulatory standard. These triggers will often represent arbitrary levels that make no reference to the ecology of the system, but instead represent socially unacceptable condition or the level of an indicator that regulators, decision-makers, or society wish to avoid or are mandated under legislative or management authorities. For example, the population density of a charismatic species that enable visitors a good chance of seeing the animal. Our studies found that there is support from both scientists and practitioners for the use of decision triggers in the management of natural systems. However, setting meaningful decision triggers for management remains a daunting task. For decision triggers to be effective there must be a commitment to ongoing monitoring of the relevant indicators. Monitoring should be targeted (ie, using an indicator where the relationship with the system of interest is clearly defined), cost-effective and well-designed to generate the information needed to make decisions. The use of decision triggers should be an adaptive process, with the iterative cycles of review commonly found in adaptive management frameworks (see Decision Point #102). As understanding of the system increases, it may be necessary to refine the conceptual model of system dynamics, the most appropriate indicator and the most appropriate management actions. The next step is to test a wide range of case studies to illustrate the application of decision triggers to real-world management problems, to provide a compendium of diverse contexts for conservation practitioners to learn from and build upon. Several management agencies are keen to be involved in the exciting next stage of the project. So, we are seeking a motivated student who wants to get involved. To help, we are offering a fully funded PhD scholarship to work with our team (led by Dr Carly Cook at Monash University). If you are a conservation practitioner and have a management case study that you would like to test the decision-triggers concept on, or feel you have a good example of decision triggers already in place, please let us know. Note: Kelly and Carly were CEED Postdoctoral Fellows during the period this research was undertaken (and are now CEED Alumni). This work was done with the support of the National Environmental Research Program (NERP) Environmental Decisions Hub, a partner network of CEED. Prue is currently based at Oxford University at the Interdisciplinary Centre for Conservation Science, Kelly is at the University of Melbourne and Carly is at Monash University. Addison PFE, CN Cook & K de Bie (2016). Conservation practitioners’ perspectives on decision triggers for evidence-based management J. Appl. Ecol 53: 1351–1357. Cook CN, K de Bie, DA Keith & PFE Addison (2016). Decision triggers are a critical part of evidence-based conservation. Biological Conservation 195: 46–51. de Bie K, PFE Addison & CN Cook (2017). Integrating decision triggers into conservation management practice. J. Appl. Ecol 55: 494–502. Now in a ‘larger-than-life’ gatefold! Bigger is not necessarily better?